A genoise sponge is light and delicate because of the air whipped into it, and it can proudly say ‘I don’t need any added rising agents! I’m just naturally airy!’ So no baking powder. And if you don’t particularly enjoy separating eggs you can throw your arms in the air and shout ‘hurray!’ ’cause the eggs are whisked whole in a genoise. Try to use caster (superfine) sugar, which will dissolve even more easily in the batter to help give you that fine-textured genoise sponge. It ‘s a great base for making all kinds of cakes filled with yummy things, like swiss rolls, the fraisier and moka cake. Make sure your ingredients are fresh and your flour isn’t old. It’s best to use free-range eggs. Start whisking the yolks and sugar immediately they’re together because if you don’t the sugar starts to ‘burn’ the yolks and lumps form. Avoid overheating your eggs at the earlier stage or you’ll get scrambled eggs (a genoise is not based on scrambled eggs, though this could be an interesting experiment). For the bain marie there should only be a little water in your saucepan underneath and it shouldn’t touch the bowl. The water should be hot so you can see the steam coming up or on a very low simmer, but it should not be boiling. Take off the heat for a while if necessary, or lower the heat. Whisk the eggs constantly. Make sure your genoise batter actually doubles or triples in size and gets to a very thick ribbon stage. Don’t stop earlier because your arm is tired – learn to switch arms and use your left one if you’re whisking manually. At the stage where you fold in the flour do not overmix or overfold. When the flour is just incorporated stop and your batter will stay light and fluffy. Overwork and your cake will flatten out and become heavy. Keep all that in mind and you’ll get the perfect genoise! Is there more than one method? 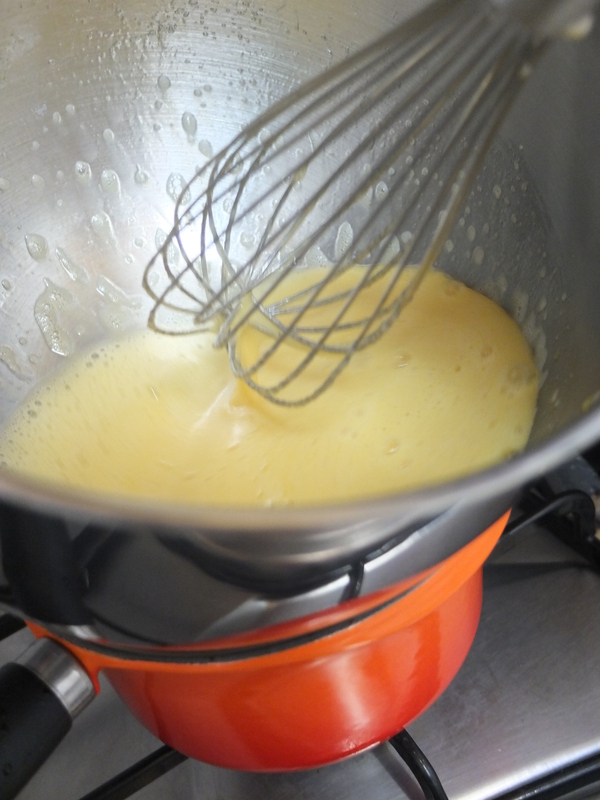 Whisk the genoise batter on the bain marie until it has doubled in volume. It should reach a maximum of 45 degrees celsius then you take it off the heat and you keep whisking till it cools and the bottom of the bowl is not warm to the touch. This is the version taught on the Intermediate Cordon Bleu pâtisserie course. Don’t use a bain marie at all – you just keep whisking until it doubles in volume. This usually takes about 20 minutes or more by hand because it’s cold. 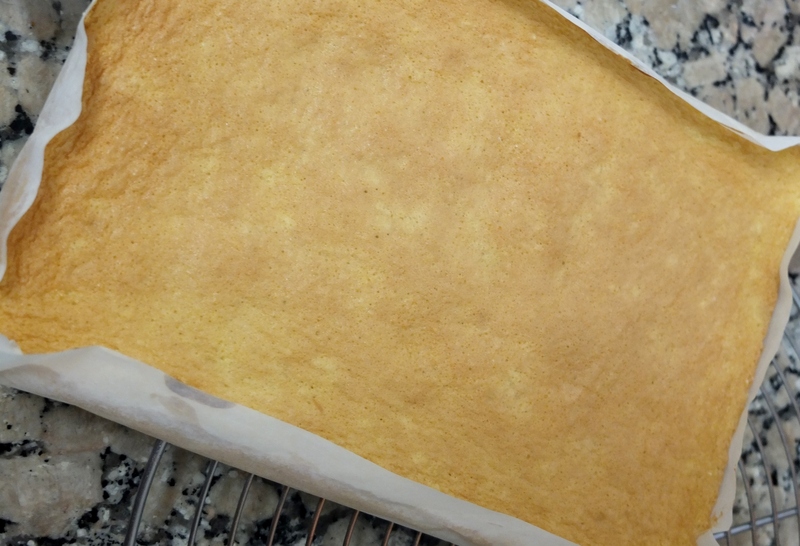 Heat the genoise batter initially on a bain marie then continue off the heat till it doubles in volume (the version we’ll use, based on what they teach on the basic Cordon Bleu course). You can use any version you like, by hand with a whisk or on your stand mixer. The addition of butter is optional but does help keep the cake moist. For the swiss rolls in the Charlotte Royale I didn’t add butter as it’s already a moist cake and doesn’t need it. Preheat the oven to 180°C (static, non-convection oven) or 160°C (fan-assisted oven). 1. Sift the flour into a bowl and whisk in the salt to combine. 2. Beat the eggs and sugar in a big bowl. Do not leave the eggs and sugar together without beating them, as the sugar burns the egg yolk and you’ll end up with little lumps. 3. 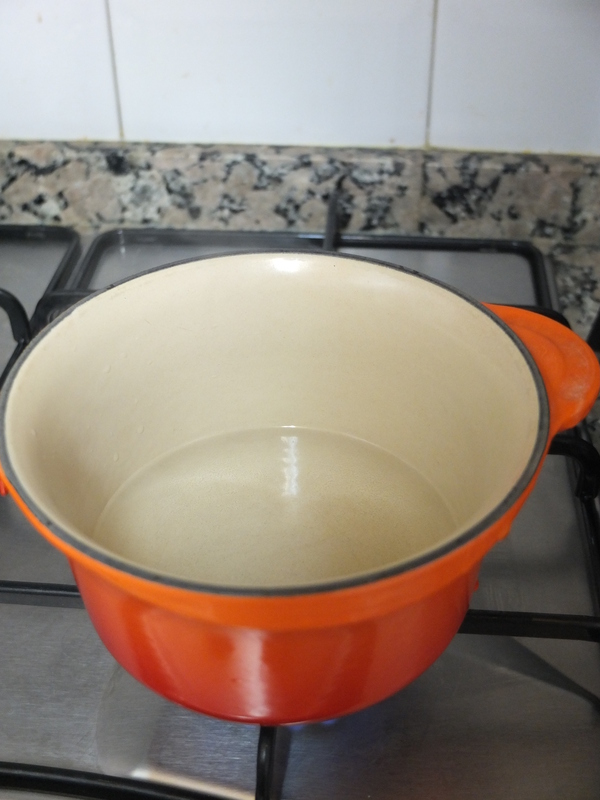 Bring a little water almost to the boil (to a very low simmer) in a saucepan that your bowl can sit on top of. 4. Continue whisking the eggs and sugar over a little hot simmering water in a saucepan. Whisk a few minutes till the mixture is foamy. 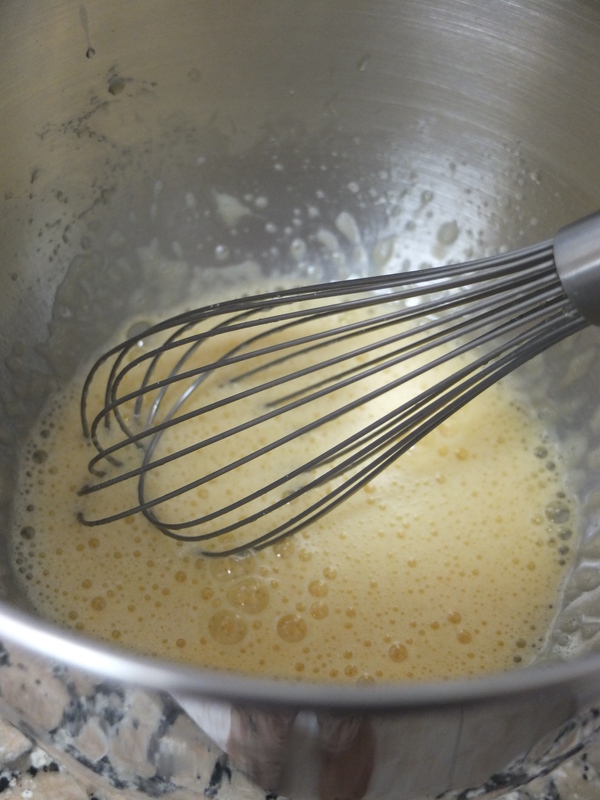 Keep whisking till the mixture starts to increase in volume and look lighter. It should be warm to touch (test with your little finger). 5. Take off the heat, add any vanilla if you want to, and continue whisking by hand (about 20 minutes) or on your stand mixer (about 5 minutes) till the mixture has doubled in volume and it reaches thick ribbon stage. 6. Add half of the flour in a stream and fold it in gently with a rubber spatula or metal spoon with a hole(s) with slow figure of eight motions, going through the middle then round the sides. When it’s starting to combine add the other half of the flour. Don’t overmix – as soon as the flour is incorporated pour into your cake tin. If you’re adding butter do so when the flour is almost incorporated. First take a little cake batter and mix it with the melted butter. 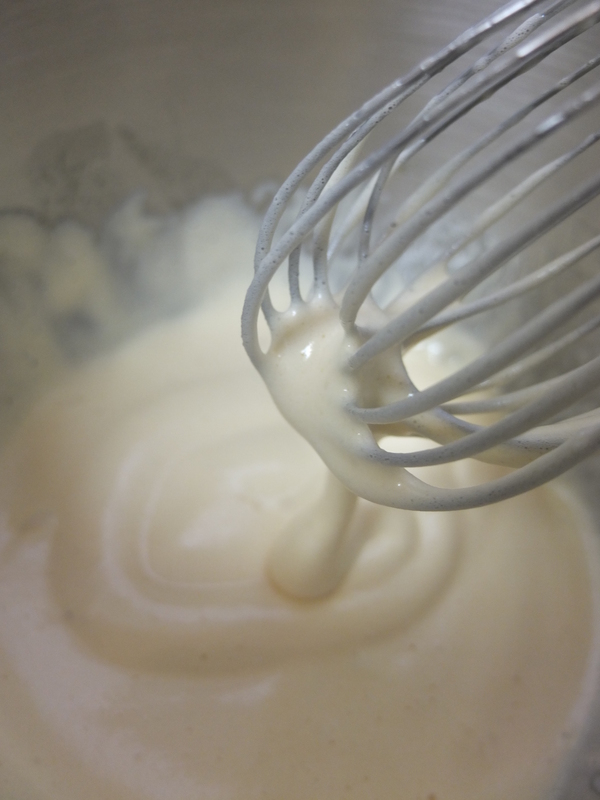 Then add this mixture into the main batter and fold gently and as little as possible. Again, don’t overmix. 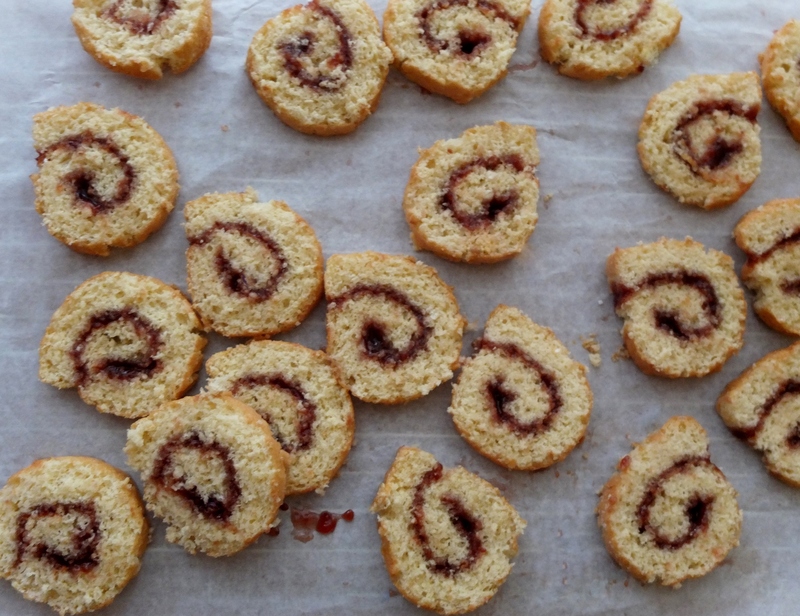 Bake in the middle of the oven for 22 to 25 minutes (round cake tin) or 10 to 15 minutes (swiss roll tray), till it’s golden, a skewer comes out clean when inserted in the middle and the top springs back a little when you press it lightly with a finger. Done! 🙂 Now have fun playing around with your genoise! It makes lovely cakes with creams, buttercreams, fruit, jam, etc. Yum…!